Super Stuff-A-Pumpkin Leaf Bag. Includes 1 - 45" x 48" bag with ties. A different face on each side. Stuff with leaves or crumpled paper. Close with twist tie. 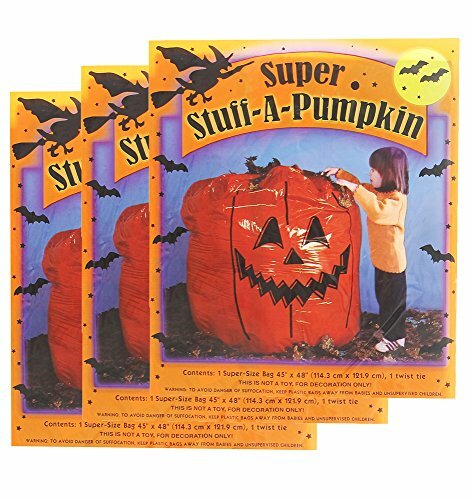 Super Stuff-A-Pumpkin Leaf Bag 3 Pack. Includes 1 - 45" x 48" bag with ties. A different face on each side. Decorate your lawn for a spooky Halloween. Stuff with leaves or crumpled paper. If you have any questions about this product by sheerlund products, contact us by completing and submitting the form below. If you are looking for a specif part number, please include it with your message.